Business-to-business marketers have been slow to enter the online marketing arena, but now that the impact of search and social media marketing in the consumer marketplace is clearly documented, B2B marketers are ready for a complete guide to making the most of the medium. Written by experts with first-hand knowledge of the field, this book clearly explains how to leverage today's search engine marketing and social media technologies to get, nurture, and convert leads. Topics include strategy, branding, monitoring, resource allocation, and much more. 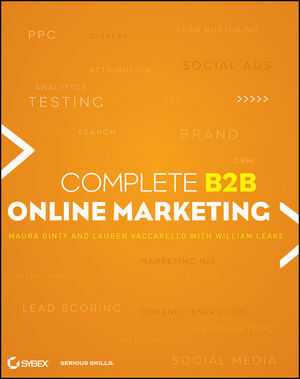 Skilled B2B marketers who are ready to take advantage of all that online marketing has to offer will find this guide provides exactly the know-how they need. Maura Ginty is a digital-era word geek with deep expertise in search, content strategy, and social media programs at Fortune 500 companies as well as small businesses. Lauren Vaccarello is the Senior Director of Online Marketing at Salesforce.com, where she focuses on developing cross-channel strategies that bridge the gap between awareness and demand-generation. William Leake is CEO and founder of the Apogee-branded marketing companies Search, Results, and Campaigns. Bill has guided them all from inception to success, with Apogee Search becoming one of the 20 largest independent search engine marketing firms in North America. All three authors are frequent speakers at leading industry events such as Search Engine Strategies, SMX, eMetrics, and others.